As for the avocado, tomato, and mint sandwich, I was surprised by how different it was from other sandwiches I have had. The olive oil, mint, and lime work unusually well in highlighting both the avocado and tomato. However, none of them overpower the subtlety of the fruits (I do not have to tell you that both tomatoes and avocados are actually classified as fruit, right?). Nor do the components overwhelm the eater with any one particular element, in highjacking the sandwich – as can be the case with certain mustards. It is a fresh and refreshing sandwich, which is a perfect for lunch in warmer weather al fresco, when tomatoes are at their peak. But I will admit to having made this sandwich first mid-winter (not exactly a locavorean triumph in the Gulf Islands, I will admit). I used a dark rye bread, though a light rye could work. Yet the heartiness of the darker Russian variety makes a bold brown visual and gustatory partner to the smooth pale green and juicy red interior. When you are in need of a quick but healthful sandwich, give this one a whirl or try one of the avocado variants above for a departure from your sandwich routine. Slice the avocado evenly lengthways, keeping the slices together. Cut the tomatoes in half, then slice each half evenly, keeping the slices together. Toast thick slices of the rye bread, as you like, then lightly brush with the extra virgin olive oil (about one-half tablespoon per sandwich). Place one quarter of the avocado and a tomato half on four slices of toast, fanning the slices out slightly. Scatter with mint, sea salt and lots of freshly ground black pepper. Squeeze the lime on the avocado, slap on the optional lettuce, if using, and close up your sandwich. Serve with a good deli pickle (it couldn’t hurt, now, could it?). 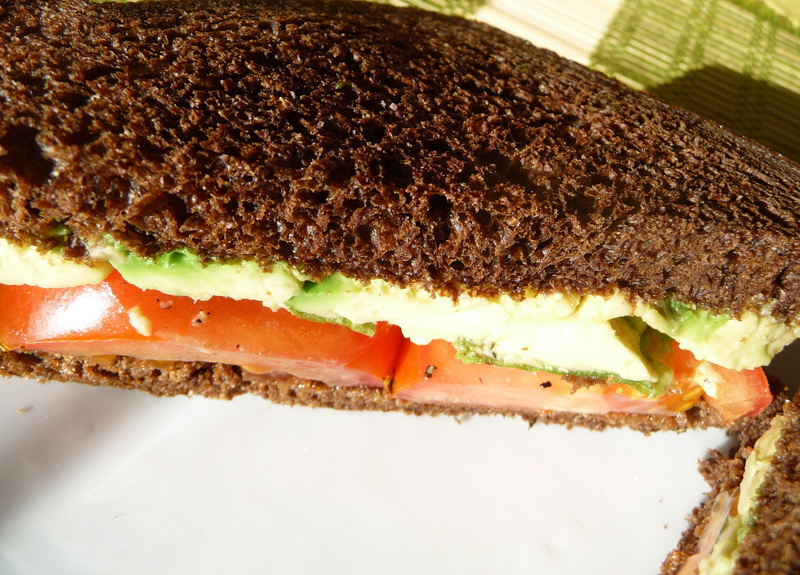 This entry was posted in Blogs and Food Writing, Brunch, Recipes Misc, Vegetarian and tagged Avocado, Brunch, easy, lime, lunch, Recipe, rye, Sandwiches, tomatoes, vegan, vegetarian. Bookmark the permalink. Hi, Michele. Thanks for the comment and the warning about GCM – time to celebrate before it gets too hot (as it that is about to happen)…. I was thinking I had better get a savoury vegetarian post so you could have something new to try. Let me know what you think. 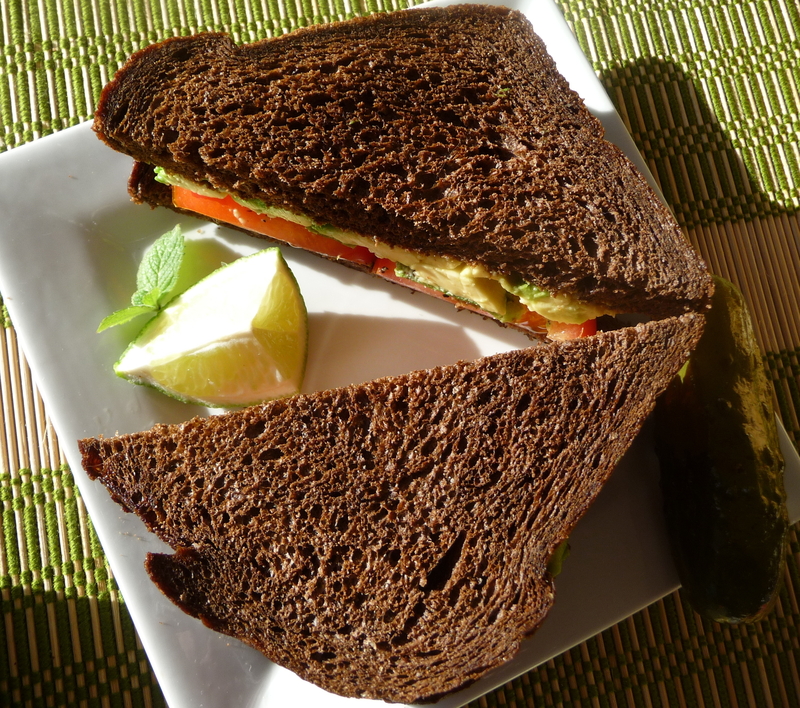 avocado and mint, a wonderful combo for a sandwich .. thanks for sharing!! What wonderful decadent sandwich ideas Dan. I absolutely love avo’s but sadly the ones available here in Mauritius are terrible. They get refrigerated and when you cut them open they are pitch black and very stringy. I am looking forward to trying your sandwiches when I return home later this year. Hi, Mandy. I imagine you’ll be happy to return to the good avocados you can find in S. Africa. It would make me very sad to encounter such bad ones in Mauritius…but you have something major to look forward to now. sliced sour dough bread, creamed cheese, bacon, Greek pepperoncini peppers, avocado, sprouts and tomato. Sinfully addicting! I have not tried mint in a sandwich before but see how it could add a nice freshness to the rich avocado and mild olive oil. I am still mentally stuck with trying to picture how a sandwich gets hijacked though. Thanks, Geni, for making me laugh, as usual. It is the powerful mustard (picture a large jar of authentic Dijon, with its French muscles) which strong-arms the subtle avocado, as the sandwich must make an unexpected detour to Mustardville, rather than AvocadoLand…. 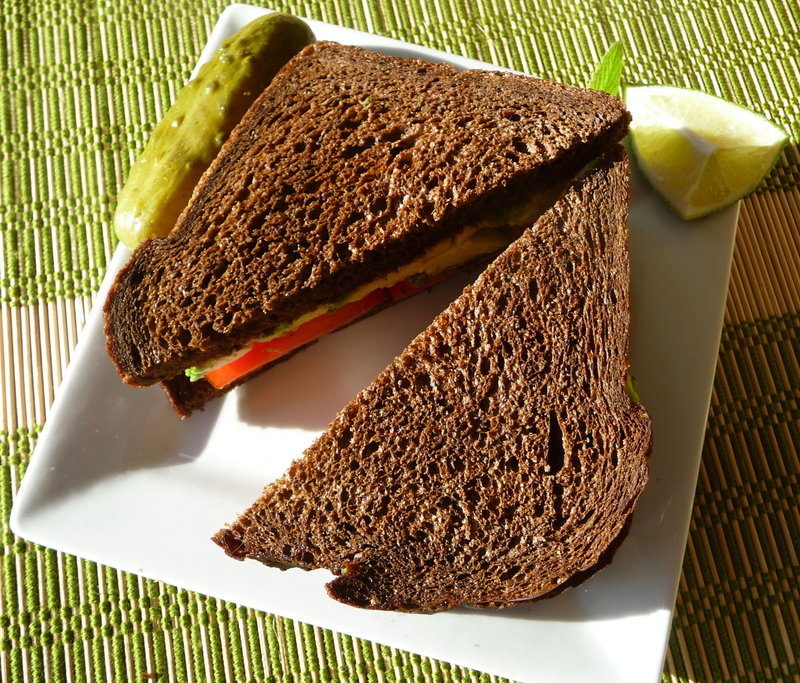 I love the sweetness of dark rye breads with avocado – it’s just so perfect. The mint inclusion here sounds intriguing, too! I don’t have habitually avocado sandwiches but with prosciutto or with mint – really these are excellent options to enjoy 🙂 I want right now one! Hi, Gera. Maybe you’ll become an avocado fan once you pair it with prosciutto, a great combination! Gorgeous, Dan. Avocado is an absolute delight on sandwiches and if you happen to have an avocado on the the turn, try smearing it on your bread instead of mayonnaise or other spread. Sooo very, very good. I can barely keep enough avocado for any given recipe if my non-winged vultures are swirling in the kitchen, scouting out snacks before they scurry back to Curious George or chasing one another. A delight to visit you, as always. Thanks, Ms. Joy. I agree about the avocado-as-spread approach – creaminess, flavour, and nutrition for the same calories as mayonnaise. It is always a joy, Joy, to visit your site, too. That sandwich issue spells trouble. 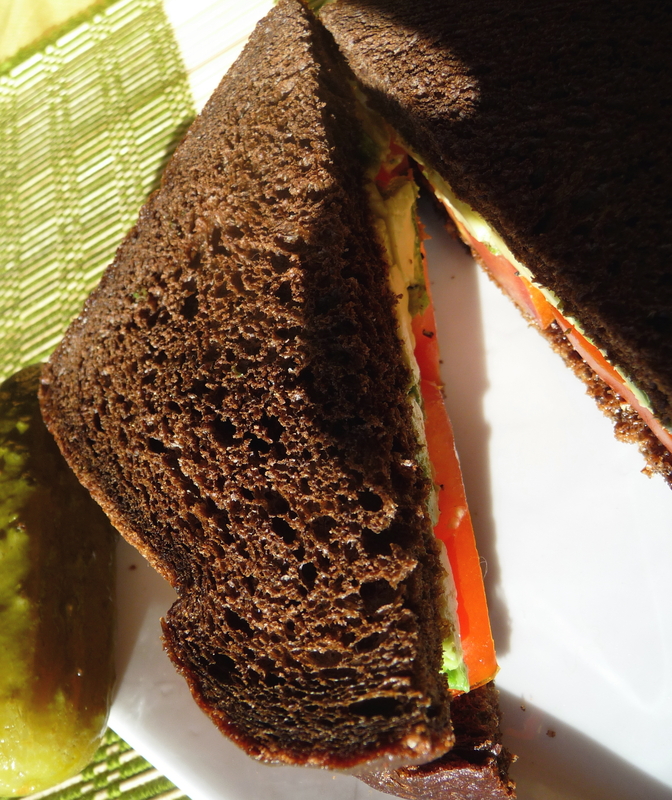 I love your version with the avocado and agree, the avocado is the perfect addition for about every sandwich.